The fabled children's story show from Broadway produced for television. A young girl wakes up in the realm of Toyland, where she teams up with her family and friends to overthrow the evil villain named, Barnaby. Feature-length, live-action musical version of the classic fairy tale by Charles Perrault. There's a crisis in Rhymeland! All the Rhymies (the characters from Nursery Rhymes) are disappearing! Gordon Goose, son of Mother Goose, and Little Bo Peep set off to find them. Narrator: Some say that as we grow up, we become different people at different ages, but I don't believe this. I think we remain the same throughout, merely passing in these years from one room, to another, but always in the same house. If we unlock the rooms of the far past, we can look in and see ourselves beginning to become you and me. Wendy, John: [dressed up like their parents and dancing] One-two-three, one-two-three, one-two-three, one-two-three. As I was growing up, this film always had a special place in my heart next to The Wizard of Oz; it was shown live in 1955 and 1960. The 1960 production was preserved on kinescope and then shown once or twice in 1961 or 1962 and never again until 1991 or so. During those years that it was forgotten by the networks, there wasn't a baby-boomer out there that had truly forgotten it. It was one of those magical shows that we all talked about and wished they'd run again. Now, it's finally available on tape and on DVD; the DVD version is very well done and the picture is colorful, bright and clear, even though it's from the only kinescope copy of the live show. It's very much a filmed stage play, and the sets reflect this. It was preserved in color, which is a miracle considering there were virtually no color sets in existence then. 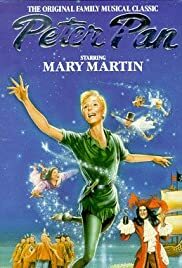 Mary Martin is great as Peter (she was 47 years old when she did this very acrobatic role! ), but Cyril Ritchard pretty much steals the production from her with his Hook. He and his pirates are so over the top that the other actors are hard put to keep up. Watch his face and his body during the singing and dancing scenes; he's just a delight. The songs are all wonderful, too. This is a film that probably won't be very popular with the children of the 90's, but my guess is that it was really meant for those of us who loved it when we were kids, because I purchased the DVD the minute it came out. Buy it while it's still available, and enjoy the memories.